Sand, Wind and Stars - LRDG, 70 years on: Peak District Shakedown. 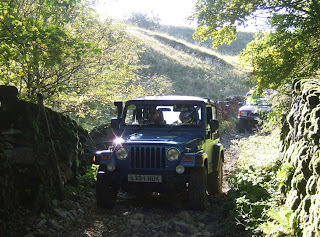 We are planning a major shakedown of both Jeeps over the weekend of 17th and 18th September. It is vital to assess an accurate idea of the petrol likely to be used on our 1200 mile Desert Expedition next Easter. It will be impossible for our logistics team to carry enough fuel for all the vehicles involved, so prior to the Expedition they will be running a fuel dump of full Jerry Cans somewhere down in the Desert, marked by a GPS Waypoint. The Peak District green laning weekend will cover about 100 miles of mixed driving - tracks and road, fully loaded with three people per Jeep (and a back-up Series 1 Land Rover!). Priority for the six available places will go to those who have signed up for the trip, but there may be a spare seat or two. Register an interest via the 'Contact' button on our web site. We shall incorporate a lunch stop at the famous Waterloo Inn. 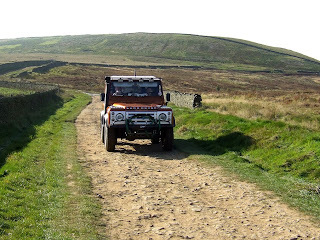 The photographs are courtesy of Keiran Johnson who has considerable experience running Green Lane tours of the Peak District and will be acting as our guide in September. 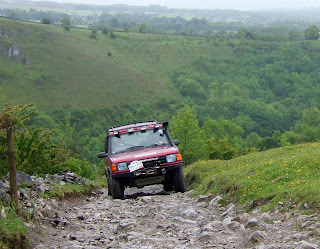 Keiran and I will recce the route sometime in August and the next Blog should report on that trip.